This was a question raised by a recent editorial in the New York Times. The writer, Daniel Duane argued that only when it comes to bicyclists, justice is often denied. “If your 13-year-old daughter bikes to school tomorrow inside a freshly painted bike lane, and a driver runs a stop sign and kills her and then says to the cop, ‘Gee, I so totally did not mean to do that,’ that will most likely be good enough.“ Why is this the case, and how can we change things? As biking grows in cities like Atlanta, we are seeing a rise in the number of bicycles on our roads. Unlike in Europe, which has more quickly adapted to bicycle-friendly roads filled with bikers, in the US bicycle users are literally on the bleeding edge of change. 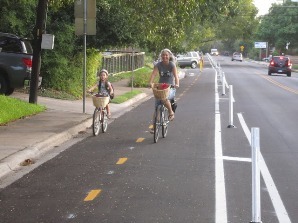 While cities are adding more bicycle lanes, in general roads – not to mention drivers – do not easily accommodate bicycles. Cyclists believe they should be respected and be able to be safe while on the road. This is a valid and true belief as the road belongs as much to a cyclist as it does a motorist. Duane’s editorial points out that we are a driver’s culture. That means people don’t think of biking as a necessary form of transportation, and see a crash involving a bike as an unavoidable accident, instead of a case of manslaughter. In a wrongful death case, juries tend to empathize with drivers, not their victims. This can be seen on the site of an accident and its police investigation as well. As Duane points out, “Most cops spend their lives in cars, too, so that’s where their sympathies lie.” Here’s a great video about problems bike riders have with police. And there are two sides to this story. Motorists say that many cyclists act like they don’t have to obey traffic rules, which makes it difficult for cars to avoid hitting them. If you find yourself in the unfortunate position of being involved in a cyclist/vehicular accident, don’t become a victim a second time! Contact a personal injury lawyer to ensure you receive justice.